On November 25th, I spoke with Barb Magee Turner (City of Waterloo representative for the Waterloo Uptown Streetscape Improvement) who said the team is currently considering whether protected separated bicycle lanes can be recommended for the streetscape improvements while balancing the needs of all street users. The team’s target for a decision and communication on next steps is December 13th. Barb implied that an additional public consult may be required. Barb said the team is targeting early February to take a recommendation to Waterloo Council followed shortly by a final approval vote at Regional Council late February or early March 2014. WaterlooBikes has published a design proposal that addresses many of the stated concerns with protected, separated bicycle lanes with a design that increases sidewalk width by utilizing the utility pole strip as a buffer between cyclists and parked cars, ensures cyclist visibility at intersections and maintains the current level of on-street parking. The MacGregor Heritage Neighbourhood Association are concerned about potential lane restrictions on King Street diverting more traffic onto their neighbourhood streets. A few members of the Uptown Waterloo BIA group who feel they need on-street parking spaces and are also concerned that reducing motor vehicle traffic on King Street will negatively impact businesses (at least one Uptown BIA member has signed the petition, so I know it’s not all businesses). The Grand River Accessibility Advisory Committee is concerned over the width and grade of sidewalks. The petition is also not the only stakeholder requesting that the project team consider recommending a protected, separated bicycle lanes. 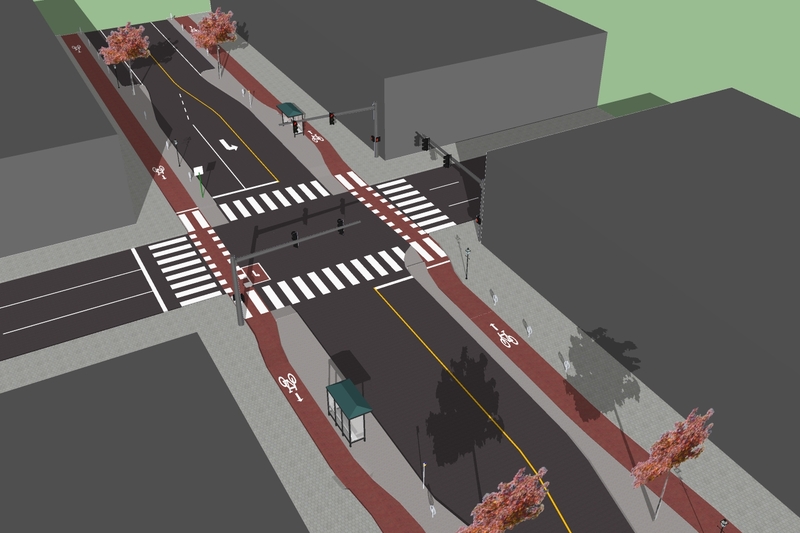 Waterloo Regional Councillor Sean Strickland and Waterloo City Councillor Melissa Durell have also stated their preference for a solution that entails projected, bicycle lanes. (Councillor Strickland is quoted in the following Record article). Encouraging cycling as a transportation mode by making it easier and safer aligns with Waterloo Regions Climate Action Plan, which was unanimously supported by the City of Waterloo and goes to Regional Council for a vote on Dec 2nd (40% of our regional carbon footprint comes from transportation). When approved Councillor Scian went as far as to say that this plan should be the lens through which all future decisions the City makes are viewed.